CHANDLER, AZ (March 14, 2016)—She grew up surrounded by the lush green hills of Williamson County, Tennessee, where she lived for 50 years, but now Kathy Peach is exploring a much different landscape, the desert southwest. Peach is coming home in April to participate in an event in Franklin where she'll be sharing her new children's book about life in the desert, The Tiniest Tumbleweed, which she wrote based on observing nature in her new habitat. The book also earned an Honorable Mention from a recent competition at the 2016 Great Southwest Book Festival. “I am amazed and humbled by the early success of The Tinniest Tumbleweed and can't wait to share it at home in Franklin," said Peach. “I will always love the gorgeous hills of Tennessee, but the Southwest has such allure for me as a transplant. It seems to enchant others too,” said Peach. Peach left the state to be close to her daughter in Phoenix, but says her love for Tennessee is as deep as her family's roots there. In April, Peach will join the founder of Authors' Circle of Middle Tennessee, who also happens to also be named Peach, at Franklin's Main Street Festival. After Peach moved to Arizona she accomplished her life's goal of earning a degree in Early Childhood/Early Childhood Special Education and taught for Head Start. Then, while creating The Tiniest Tumbleweed, she incorporated a method of writing children's literature designed intended to build a sense of self confidence in readers, that was designed by psychologist Albert Bandura, Ph.D.
Meet Kathy Peach and hear the story of The Tiniest Tumbleweed at the Main Street Festival in Franklin, April 23-24 at the Authors Circle booth. The Tiniest Tumbleweed (ISBN: 978-0-9981033-0-3, softbound; eISBN: 978-0-9981033-1-0, eBook; $12.95 US/$13.95 CAN) is self-published by Reading with Peaches and is distributed by Midpoint Trade Books, Ingram, and Baker & Taylor. It is the story of two Sonoran Desert characters, a tiny tumbleweed and a baby house sparrow. Both Tiny Tumbleweed and Baby Sparrow enter their worlds with similar challenges—they worry they are too small to accomplish the things bigger tumbleweeds and birds do, like making seeds and flying. “Will I be as big and strong as my brothers and sisters?” they both ask, expressing their insecurities. The timeless theme of the story is presented with Mother Tumbleweed's wise response: “You will be as big and strong as YOU will be, and that is just fine, just fine indeed.” With these words, each of the tiny ones decide to take on the difficult tasks of doing the work needed to help them grow. As a result, at just the right time, they provide the perfect help for each other, fulfilling their passionate need to be useful. Peach says she developed the story to help children believe in their own capabilities. At a time of life when most people begin to slow down, Kathy Peach decided to follow her lifelong dreams of earning a college degree and writing a children's book. She moved from her home of Middle Tennessee to Arizona, and graduated from Arizona State University in December 2014 with a degree in Early Childhood/Early Childhood Special Education. Peach is now a teacher for the Head Start program in Phoenix. “A tumbleweed may seem an unlikely character, but just as the Southwest has such allure for me as a transplant, it seems to enchant others too,” said Peach. “After moving here, I saw a tiny bird dive into a tumbleweed near a fence. I almost wrecked my car watching the bird fly inside the tumbleweed but I didn't see it fly back out. I returned to that place several times to observe tiny birds fly inside tumbleweeds and simply sit." It was the synergy between living things and the boundless opportunities that relationship provides that helped inspire the characters and the story. 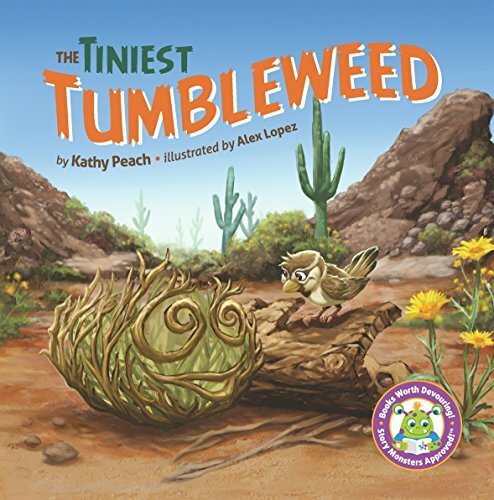 Edited by award-winning children's author Conrad J. Storad and charmingly illustrated by Alex Lopez, The Tiniest Tumbleweed supports Arizona's College and Career Ready Standards (Common Core) for third grade English Language Arts (ELA). The book includes a curriculum guide with facts about tumbleweeds and sparrows following the story. Slated for release in winter 2016, The Tiniest Tumbleweed (ISBN: 978-0-9981033-0-3, softbound; eISBN: 978-0-9981033-1-0, eBook; $12.95 US/$13.95 CAN) is self-published by Reading with Peaches and is distributed by Midpoint Trade Books, Ingram, and Baker & Taylor.